UKIP leader Nigel Farage has defended his comments that immigrants with HIV move to the UK as ‘health tourists’ as a means of claiming free treatment by displaying a letter from a patient who shares his views. During his appearance on the seven-way leaders’ debate, Farage caused outrage by claiming that HIV positive ‘health tourists’ were costing the NHS more than £2 billion per year. On Thursday, he backed up that claim by reading a letter he had received from a 30-year-old HIV patient who said he only had enough medicine for two further weeks of treatment. “I now have to wait three weeks to have a blood test appointment before I see my doctor. We used to be able to do this the same day,” the letter read. “The waiting rooms are full with immigrant patients. Not only is this massively increasing cost, it is burdening the small specialist system to the point of failure. “Something must change and I support your comments fully. 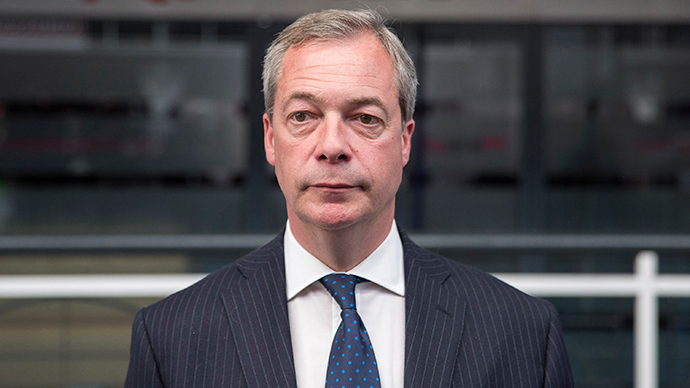 Despite being corrected by the host of the program Jo Coburn, who told him than only 0.06 percent of the NHS budget is lost to ‘health tourism,’ Farage continued to back his assertion. “The issue I specifically raised was the issue that since 2012 anyone can come into Britain, not to live, but to get HIV treatment on the NHS,” he said. “He says it is because since we opened the door in 2012, we’re now incapable of providing HIV treatment to people who live here in Britain,” he added. According to analysis by YouGov, nearly half of voters agreed with Farage’s idea that immigrants should not receive free HIV treatment immediately. The poll of 1,906 adults found that 50 percent would support “people coming to live in the UK being banned from receiving treatment on the NHS for a period of five years,” but a further 34 percent would be against such a proposal. Farage was also called out by Plaid Cymru leader Leanne Wood during the first TV debate, who said he should be “ashamed” of using people suffering from the disease to appeal for votes. The UKIP leader’s last-ditch attempts to win over voters may have come too late as the latest polls predict he is set to lose his battle for the South Thanet seat.